Red Flag Days: The Ression Is Over? According to the President, the recession is over. Aren't you glad? According to BHO given the stock market is up to 9000 and the great success of the stimulus program we are on our way back to easy street. With just 10% of the stimulus money in the system, the recession was whipped. Imagine what our economy will be like once the full stimulus is into the economy in 2011 or 2012. DOW up over 15,000. 30% returns on our 401(k)s. Interest rates in the low 2 to 3 percents. Unemployment at historic lows of 3%. Home values once again sky rocketing, growing at 9% a year. New car sales blowing out all past records. Cheap easy to get health care. Banks charge only 4% interest on credit cards. Free mortgages with low interest rates to all. Prime Rib in every pot and a H3 Hummer in every triple garage. Sounds too good to be true, eh? Indeed it is. The Watchman also listens and reads the stories behind the headlines. 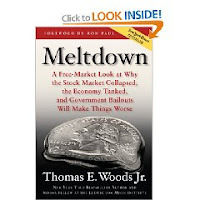 I heard an interview of Thomas E. Woods, author of a book just out entitled "Meltdown". I haven't read the book, but what I heard from the interview was enough to convince me he knows his economic stuff. Woods indicated there were still a few areas of tremendous instability in the economy, fault lines where economic earthquakes can yet occur to bust BHO's bubble. He likened our current status as being in the eye of a hurricane. Calm waters before the storm moves back over us. The largest danger it appears stems from the commercial real estate market. According to Woods the commercial market is just now beginning to come into stress as did the residential housing market did a year ago. Why? Again Woods explained the mortgages of commercial properties generally have different terms that created opportunity for many investors to jump into the market thinking they could buy these properties and then lease them out for a profit. With the recession, many of these properties can't be leased and the default rate is climbing similarly to that of the housing market. Banks and other financial institutions are holding a lot of bad paper that will default in the next few months, again creating conditions for a crashing of the economy as bad as or worse than the one of September 2008. Wood had two other fault lines grinding together, interest rates and inflation rates for critical sectors is showing increases. Both tend to make economic conditions still more unstable. The Watchman doesn't want to be a doom and gloom guy, all negative and worry wart, but believe all of us need to carefully observe the true numbers and not rely on the wishful thinking of a rookie President and his 38 czars of dubious ability.